Does it remind you of something? Something you played with for hours as a kid? 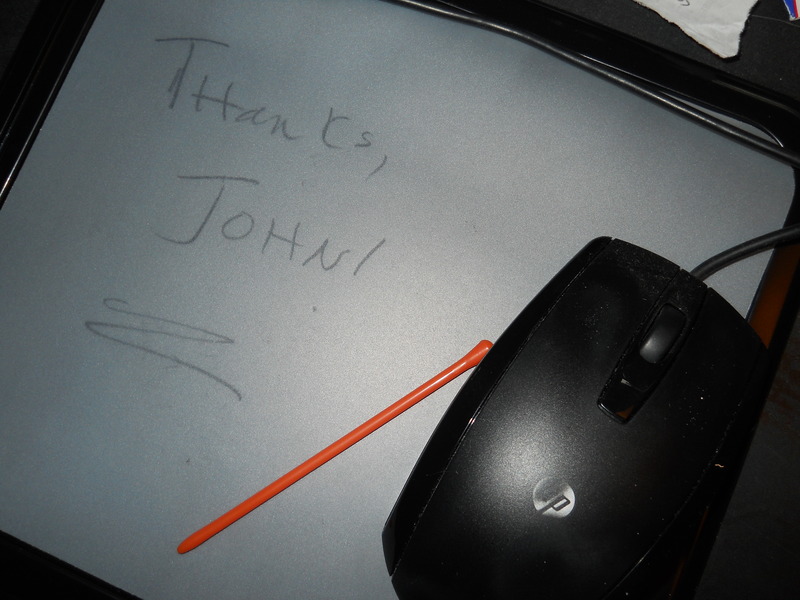 Hint: You can write on the mousepad, then with a flick of your wrist, the message disappears. The Magic Slate, right? You can write little notes to yourself while you’re working on your laptop, and then when you don’t need the note anymore, you just lift the magic page and it’s clean again. It’s perfect for those times when I’m editing a long manuscript. I’ll jot down the page I’m working on for quick reference when I return to it. And often, I’ll be working from several versions of the same manuscript so I’ll have several page numbers on the pad. 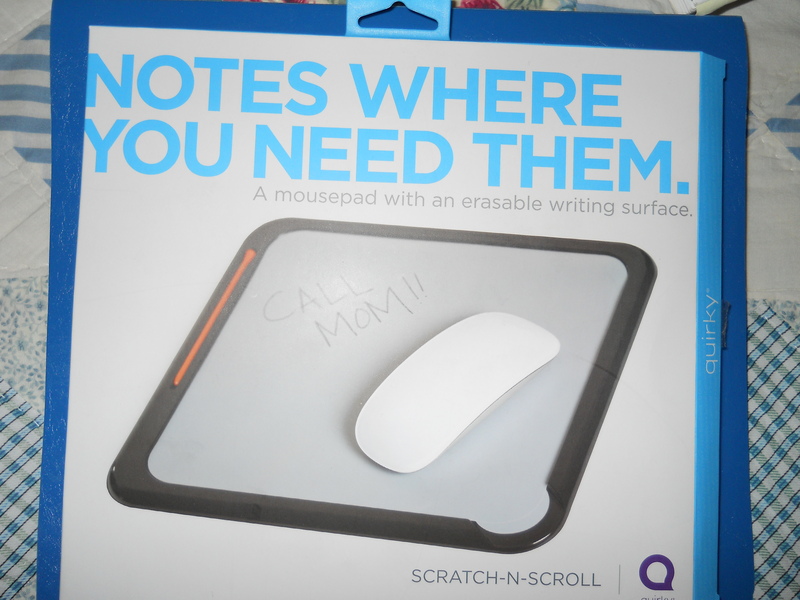 Now, honestly, I don’t know if I would’ve bought this mousepad for myself. It’s handy as heck, but not necessarily…necessary. But Youngest Junior Hall found it on a website called Quirky, knew I’d like it, and voila! The Scratch-n-Roll arrived at my house. I think I may have mentioned Quirky before–it’s a website for inventors to get their products out there to the masses. Of course, there’s more to it than simply inventing–and if you know anything about inventing, you know that’s a tough row to hoe, anyway–but Quirky is one way to pursue your entrepreneurial dreams. Which brings me to the second reason this mousepad was totally awesome. Youngest Junior Hall (the business major) learned about Quirky in his entrepreneur class. So when he called to tell me my gift was on the way, he wanted me to know that he’d found it on this website called Quirky. “You’ve probably never heard of it,” he said, implying that his mother is of that generation mere days away from being put out to pasture. I cannot lie. There was a moment, a paradigm shift, if you will, while Youngest Junior Hall considered that his mother was already signed up at a website he’d just learned about in his la-ti-da business college class. Hahahaaaa! What a great post! And yes, totally awesome! Way to go, Cath. But I have to say, those magic slates always bugged me. Some kid would scribble too,hard and ruin the whole thing. (Okay, so it was usually me) They didn’t last very long among five girls! Apparently you did NOT just crawl out from under the rock where you were born just yesterday. Hehehe! That had to feel great! AND you got a cool mousepad. Sometimes life is so sweet.